"This is a very simple clone for that overpriced name-brand bottled coffee drink I somehow became addicted to. It's also a great way to use the leftover coffee that always ends up getting dumped down the drain the next day." Mix milk, coffee, and sweetener together in a glass until sweetener is dissolved. Sometimes I brew a pot of coffee with the sole intent of making one of these for breakfast the next day. As soon as everyone has had their fill of hot coffee, I simply put the pot in the fridge. I usually pour the coffee in an empty water bottle and add some flavored creamer and put it in the freezer for about an hour and it gets good and slushy! Made this today with skim milk, 1 packet of equal and coffee from our Keurig coffee maker. Served over ice. The possibilities are endless with this one. 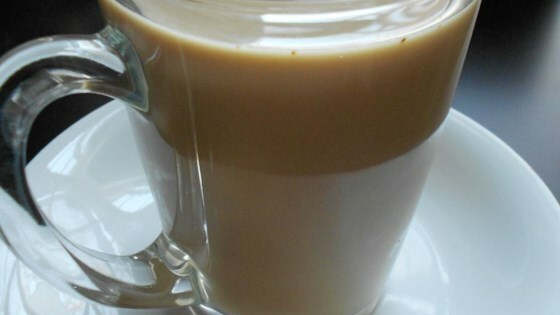 What a quick coffee on the go recipe. I was really skeptical, but this was very good! I can't wait to try it more during the summer time.